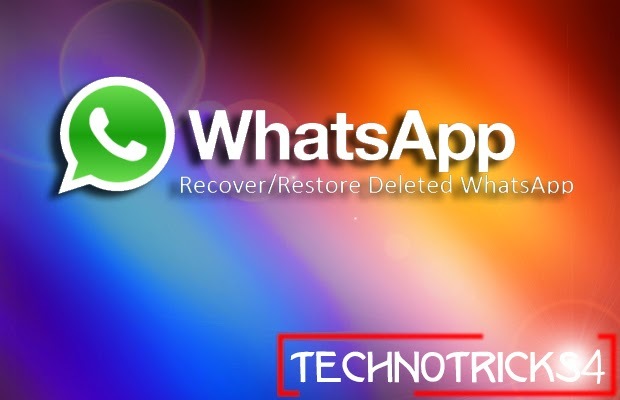 Hello guys, Today I will be discussing with you a very important trick by which you can easily Restore deleted whatsapp messages. We all know that whatsapp is the most popular instant messaging application available for our smartphones. Every other person in the world is using whatsapp for communicating with friends, relatives and family. As you all know that touchscreen devices are just awesome but sometimes they can be very annoying. With one wrong touch everything can get easily erased. Let me put a situation for you. By touching a wrong option you can easily delete your all important conversations available on whatsapp and then what will be your next step? Many among us know that how to Recover deleted whatsapp conversation on their smartphones. But for those who are not knowing about this trick, today this article is specially for those guys only. Below I have separated the Restoring process in 2 simple methods. So, without taking much time let’s move over the first method that is of by recovering whatsapp deleted conversations by manual method. There are very less amount of people who know’s that whatsapp creates daily backup of all the data at the system time i.e, at 4 a.m. These backup’s normally get stored in the SD card. So, if you are searching for how to get back deleted messages easily then carefully start following the below listed steps. Step 1. Firstly, Open your SD card and then go to WhatsApp > Databases. Step 2. After opening the Databases Folder you will see your conversation backup files which are like msgstore-2014-04-05.1.db.crypt. These files are not given these names simply but if you see carefully then you will notice that these files consist dates. Step 3. In that folder you will see that there is one file named as msgstore.db.crypt, You have to simply rename that file by adding a word in front of it. Step 4. After performing the above steps carefully, search for the file which shows you date before you have deleted your conversation. Step 5. After finding that file, rename that file tomsgstore.db.crypt. Step 6. Now go to Settings > Applications > Manage applications > Whatsapp and then clear all the data. Open whatsapp again and then choose the restore option which will be automatically be shown to you as you open the application. That’s it. You have now all your deleted messages which are not actually deleted from your phone. So guys, this one is the manual method now let’s move towards the next method. Keep reading this article and find out. By seeing the name only you all guys came to know that we will be taking some online help for Restoring deleted chats. Exactly, In this method we are going to take help of a web application which is know asRecover messages. Recover messages is an online application which is specially designed for such incidents only. You can use this service absolutely free of cost. But the next question rise is that how to operate this website ? Just start following the below steps and Resotre your conversation on your smartphone back. Step 1. Go to http://recovermessages.com/ and then click on select SQlite file to upload your database file. Step 2. Select The Database file which you are willing to recover from your SD card. Step 3. Then simply Accept the terms and conditions of use and then click Scan. Now, wait to a minute and then you will be shown all your deleted whatsapp conversation again back on your smartphone. So, isn’t this method simple for use.